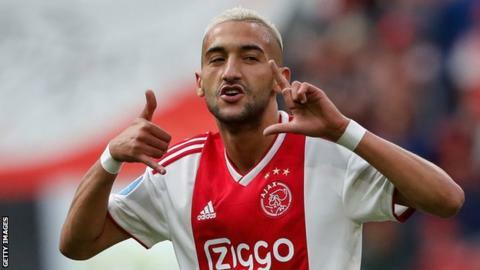 Morocco and Ajax midfielder Hakim Ziyech has won the Dutch Footballer of the Year award known as the Gouden Schoen (Golden Boot). He succeeds his international team-mate Karim El Ahmadi, who tookthe award last year for his feats with Feyenoord. The award is given by newspaper De Telegraaf in partnership with the Dutch football federation. "Ziyech is a piece of jewellery for Dutch football," Ajax coach Erik ten Hag said. "I think he plays football in a nice team, with lots of good footballers around him and it runs smoothly, which gives him pleasure and motivation to achieve even more." The 25-year-old scored nine goals and weighed in with 14 assists in 34 appearances for Ajax last season as they finished second in the Eredivisie. Ajax's managing director Edwin van der Sar expressed his happiness that Ziyech will be at the club for another season after he looked set for a move to Italian club Roma. "We said we want to play in the Champions League with the strongest possible team," he said. "We may not have counted one hundred percent on Hakim, but we are very happy that we have come together and that he is here for another year at Ajax." Ziyech insisted that he has no regrets about staying with the Dutch club: "I'm very happy here and I think I'm in the best phase of my career." He was also voted Ajax's player of the season by the club's supporters. Ziyech, who was part of the Atlas Lions squad at the World Cup in Russia, becomes the third Moroccan to receive the award after El Ahmadi last year and Mounir El Hamdaoui in 2009. Ivory Coast striker Wilfried Bony was the winner in 2013 after his stand out season with Vitesse Arnhem.